That’s my run from Thursday, along my most common route for a short run: Out on sidewalks along Curtis Road and First Street (around “The Place), and then the rest of the way on trails back through the Lake Park Prairie (along what we call the High Road—on top of the berm along the north edge of the prairie), over the weir across the creek that feeds into the Embarras River, past the little pond and down along the west and south sides of the Lake Park Woods, and back again across the weir. If you’re a reader of this blog, your opinion is earnestly sought: Is that better than the workout sessions I used to share via Endomondo? Or did you never object to the closed tools in the first place? If you simply have no interest in my workout tracking data, that’s okay too. I ran 7.73 miles a few days ago. As best I can tell from my fragmented records, that’s my second-longest run ever, after an 8-mile run I did in 2004 while getting in shape to do the Lake Mingo Trail run that year. In an email discussion, my friend Chuck lamented that he wasn’t currently in shape to match my feat, blaming part of his circumstance on trying to add mileage too quickly, leading to hurting himself. Looking at my running log, I was surprised to see how few runs I’ve taken this summer—I’m really just averaging about one run a week. I knew in theory that long walks would replace runs to a certain extent, in building and maintaining the fitness needed to go for long runs, but am surprised it replaces them to this extent. 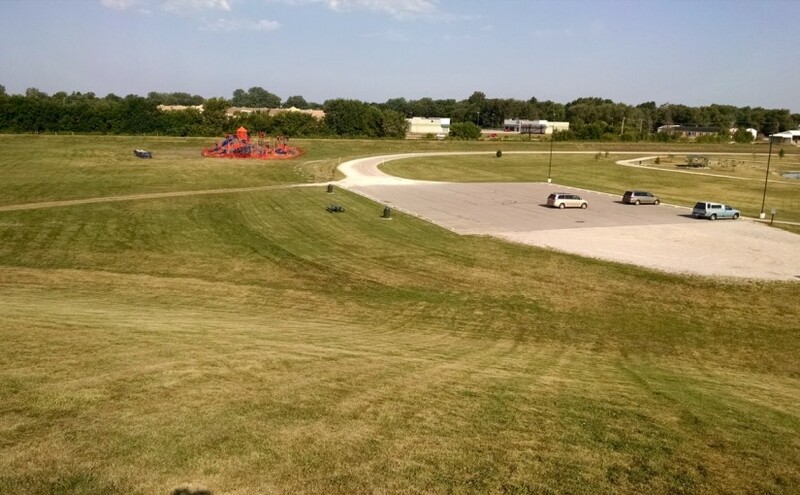 One thing I don’t get enough of around here is hill climbing—it’s just too flat. 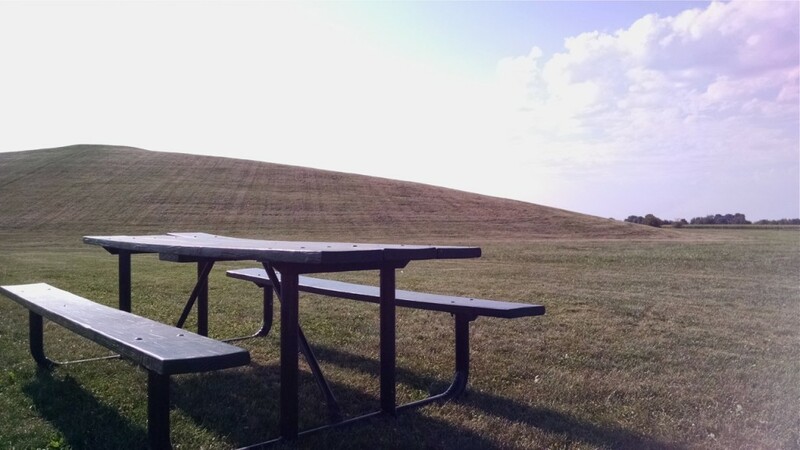 However, there is one reasonably large hill close to me, in Colbert Park. I’ve long wanted to do hill repeats here—run up the hill hard, recover while jogging back down, and repeat. But it’s just far enough from home that on my previous runs to the park, I didn’t manage to do repeats—just up the hill, back down, and then home again. Today, though, I did five runs up the hill. 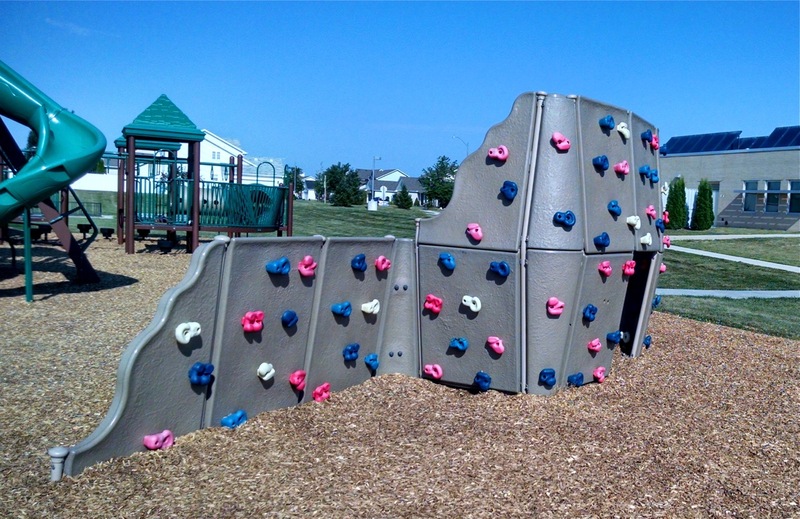 Both to and from, I pass Prairie Fields Park, which has a pretty good playground, including a climbing wall. On the way to the park, I paused to do a short wall-traverse, just working my way around the corner there. After I did it, though, I realized that I’d cheated—I’d climbed up to where I could use the top of the wall as a handhold, which made it too easy. So, after my hill repeats, I returned here and did it again, this time avoiding using the top of the wall. I worked my way around the corner okay, but found myself stymied when I wanted to traverse the next segment, where there’s a gap in the bottom. I’ll have to try that again next time. 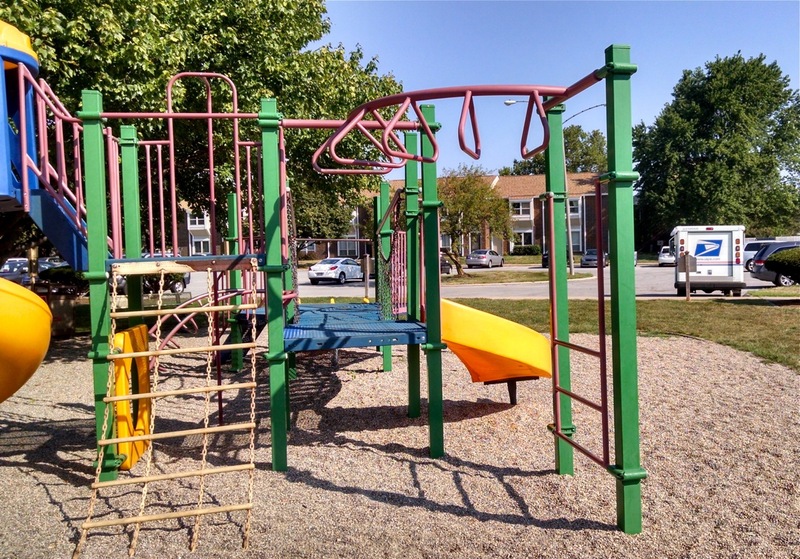 Back in Winfield Village, I visited one of our playgrounds, where there’s some bars set up for brachiating. I’ve been working up to being able to swing from bar to bar, but had imagined that I’d need to be able to hang from one hand to be able to do it. Turns out, to swing from one hand to the next you only need to be able to hang from one hand for a moment, and I can already do that. I went from the ladder to the platform, turned around and went back about two bars, but didn’t make it all the way to the ladder. Next time, or maybe the time after. From a different playground, the one right behind our townhouse, I practiced jumping down, first from a lowish level, about two steps up, and then from slightly higher, about three steps up. All in all a very satisfactory morning of movement. Plus, in the afternoon, we got in a bit of a walk with Jackie’s mom in downtown Champaign. 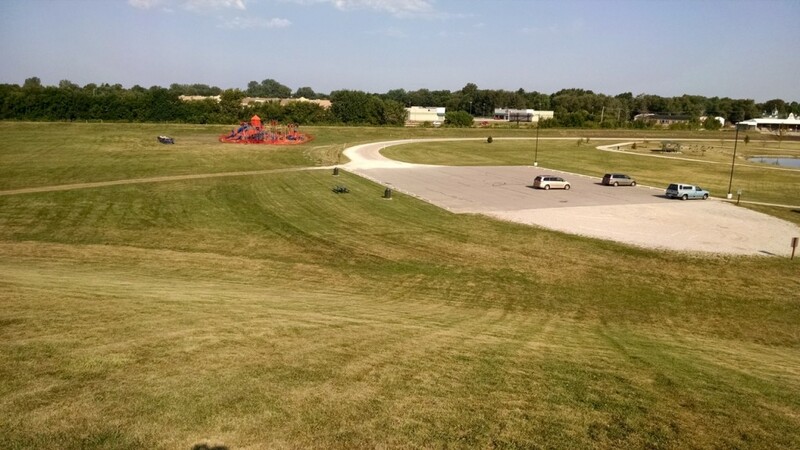 Here’s the view from the top of the hill at Colbert Park. It looks like there’s yet another playground going in there as well!